Top 6 Hard-to-believe Headlines of 2014 At Pet Health Network, we see all sorts of animal stories every year. This year, there have been six headlines that we found especially entertaining. See what you may have missed in 2014! 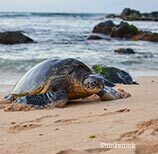 Witnesses said the turtle was a leatherback, which, according to National Geographic, “are the largest turtles on Earth, growing up to seven feet long and exceeding 2000 pounds.” Leatherbacks also migrate further than any other turtle — as much as 3,700 miles one way — which perhaps explains this turtle’s surprise appearance. While many brides would be upset by an uninvited guest at their wedding, this once in a lifetime sighting was probably worth the extra table setting.